Drug dealers, with the help of the local sheriff, are growing marijuana on the mountain behind Jesse Surratt's Appalachian farm. When Jesse interferes to prevent the murder of a young woman he finds himself in a struggle for his life. ...will be pleased to take your order! "Home Call is a fascinating, old fashioned yarn in an intensely modern setting. Sloan is a master of the unpredictable and the skillfully drawn characters draw you deeply into their lives whether you want to be there or not. This is a fine read." "Home Call is an important and original look at contemporary Appalachia. Sloan doesn’t pull any punches and bravely exposes both the beauty and the pain of living in a world that is caught up in the complexities of honoring the past but also moving forward into unknown territory. This is an Appalachia that readers haven’t seen yet, and it’s about time they did." "Bob Sloan doesn't waste a word as he rolls out the cast of characters who people Jesse Surratt's life, letting us in on the news that not every soul in his Kentucky mounains is tenderhearted --- or morally upright, for that matter. This book is hard to put down, and is sure to bring waves of homesickness to all those of us who wonder if maybe we could go back home and try our own brand of living down our past. What a storyteller! Thanks Bob." 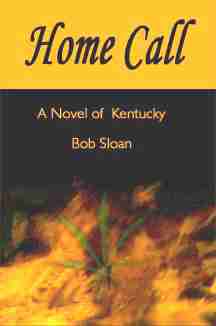 Readers who were hooked by Bob Sloan’s simple, organic style and the poetry of his prose in the short story collection Bearskin to Holly Fork: Stories of Appalachia will appreciate another side of the writer in his soon-to-be-released novel, Home Call. The mood and flow of his short stories, incipient with detail, makes you want to read slow and savor every line and page, content to be carried to the story’s conclusion. In the novel, you have the same complex, introspective narrative but the book is truly a "page turner" as you get to know Jesse Surratt and are pulled into the world of this solitary single man who returned to a family farm after a trauma in his youth, but soon found that running away had neither lifted the pain nor resolved his old wounds. Jesse Surratt left home when he was 17, to join the Navy and see the world. The reader learns early on that he did so after the comfort and safety he felt in his small town were destroyed by a trusted mentor. A victim of sexual assault, he escaped and put healing on hold while exposing himself to danger of another kind in war. He returned at the age of forty a changed man, a big man who kept others at bay with his size and surly disposition, who looked to avoid more fighting, afraid of an anger and rage that had never really dissipated. For many years after his return, Jesse Surratt kept to himself with his animals on the forty acres where his father had farmed tobacco. His need for human contact showed little to others, perhaps only to his series of wives over the next sixteen years, women he bed, wed and ultimately divorced. Margaret, his third wife and the woman he truly loved, remains a friend throughout the story, appearing as both refuge and conscience. She encourages Jesse to let the man he is inside come through, without fear, and the reader suspects she either knows him a little better than he knows himself or if not, she’s prepared to tell him she does, which he tolerates time and again, perhaps because he suspects she may be right. This intricate character living in seclusion at the age of 56, quietly farming tobacco on his land, jousting with a cantankerous old mule whose surly disposition is oddly agreeable, seems to have resigned himself to ending his days alone, until the mosaic of Jesse’s life shifts and his peaceful, predictable existence is irrevocably shattered. Or more precisely, shattered again, in a painful and wholly different way. As the tale unfurls, the dark side of Hawkes County is exposed when a young black woman’s assault and attempted murder on Surratt’s land lead him to discover a drug operation that has infused his home town with corruption that stretches beyond his, or anyone’s, wildest imaginings. Home Call is not only a great read with an intricate plot, but it tackles in a quiet yet powerful way the stereotypes of the solitary Mountain Man, the small-minded, racist Southerner, and the "ignorant redneck," replacing them with real-life, multidimensional characters. Jesse Surratt is painted by Sloan as intense, contemplative and open-minded, simultaneously a traditionalist and a modernist, a rich product of his Appalachian heritage, but someone who isn’t limited by it. His trauma, a sexual assault by another man, is dealt with in a true and dignified manner without bawdiness. This disturbing part of his past leads him to run from a community he fears has branded him and where he suffers deliberate reminders of the abuse, only to find that he may have unwittingly branded his community, in turn. When he vows to deal with his plight --not, at first, eagerly, but after much internal debate and turmoil -- he’s doing it for himself, for the young woman he has come to protect, and for his home town, as well, and his whole sense of rightness with the world. He faces the hardest of tests, as he struggles to believe again that good is possible in a world gone dark and sad. Through his eyes, we experience the whole gamut of emotion as he finds that the people he thought didn’t know him or accept him, people whom he thought wouldn’t understand, are there for him in ways he had never expected. Sloan has a gift for complex threads that smolder throughout the plot, as well as creating simple yet elegant prose, and drawing interesting characters. Alma, the young black woman, is another example of how Sloan’s characters are anything but stereotypes --a theatre major, a blue-eyed black woman, Alma is tough and shameless, with maturity and worldliness beyond her 27 years. The story of how they deal with their trauma together is a compelling read and you’ll be amazed at how quickly you want to get to the climax, to know how the story resolves. All told, this is a wonderful first novel by Sloan, a story that reminds us that we can’t --and shouldn’t want to-- escape our past, that our heritage is something to embrace and rejoice in, and that in the most unlikely corners of our past, in the darkest of times, we may find the keys to strength, hope and redemption. I judge books by their covers. I would prefer not to, but in the past decade or so I have received about 1500 books from publishers and self-published authors. These folks want me to read, enjoy and acclaim their respective books. I can’t read them all, and lawd knows I wouldn’t enjoy them all, so I prejudge books by the score. I’ll read the book synopsis, the critical blurbs and the author bio to get a sense of whether the book in question is going to do me right. I’ll ponder the title to determine what kind of story may be folded up inside. Other factors can subtly effect my decisions as well: the cover art, the reputation of the publisher, even the price. All of this information can be gleaned from the book’s cover, and that’s why I’m forced into living much of my life contrary to one of our culture’s most quoted proverbs. Of course, chances are good that you it do, too. And it’s obvious that publishing professionals don’t live by the book/cover maxim, because they keep putting judgeworthy information on book covers. Perhaps I shouldn’t take old sayings too literally. But here comes my point: I’m sure that I have missed out on a lot of damn fine books because the packaging misrepresented the quality of the product. Home Call, by Bob Sloan, was almost one of them. The cover art for Home Call depicts a marijuana leaf (or so I’ve been informed by some of my "hep" friends) amidst what I’m assuming is some fire, against a black background. You and your buddy's Photoshop could have designed it before lunch. The full title, Home Call: A Novel of Kentucky, in combination with the cover graphic, fed a cynical impression through my book-jaded mind, to wit: "Huzzah! Here’s another simile-soaked, crypto-autobiographical, first (probably last) novel about an expatriate Eastern Kentuckian who heads back to the holler, but can’t go home." I was not excited to read this book. I did it anyway, I think because I’m a Kentuckian. I’m insulting the hard work of strangers here, possibly even the very fella that I’m about to praise. But if you’re a great book, you’ve got to wait for a great cover to present itself. There are too many crappy books with great covers out there, willing to leap into the path of the bookstore/library patron before she ever passes her eyes quickly over your mediocre trappings. I’m now officially done saying negative things about Home Call. Even the cover has redeeming qualities: the blurbs are joyful praises from three authors of true quality (Jim Harrison, Silas House and Linda Scott DeRosier), and everything inside thence is kickass. My first impression of this Home Call was utterly oblivickiscerated by the third chapter, and after that I was just reading a damn fine book. Home Call follows a week in the life of Jesse Surratt, a Navy veteran who took over the family homestead after his father died. He’s living in self-enforced loneliness on a ridge that backs up to the Daniel Boone National Forest. He’s thrice divorced, he tries to avoid Bourbon binges, and he succeeds quite often. He’s got the horrible, shameful events of a night 30 years ago gnawing him down every waking moment. When there’s a disturbance on his property, Jesse meets Alma Washington, an unlikely young private investigator, and he quickly gets exposed to the nasty changes that have pervaded the region during his naval career. Men and women who had never been tempted by commerce in bootleg alcohol have now succumbed to the sky-hi profit margins available to successful marijuana growers and their hidden network of protectors. These men and women are Jesse’s neighbors, and he cannot easily discern friend from foe. Home Call may sound like a backwoods thriller, and it really is exciting and well-paced, but it’s more’n that by a fair piece. Bob Sloan knows people, and he knows his people. He shows us how shame can rule a person without ruining him. He illustrates how open secrecy, a form of community shame, can work in today’s Appalachia. Sloan delivers on dialogue, he portrays great characters with apparent ease, and he does all this with economy and a complete lack of both pretense and pretension. I’m a somewhat broadly-read guy (see above, where I boast about how many book covers I’ve glanced over). I can, and do, appreciate artful writing. But artful can become artificial in the wrong hands. Bob Sloan is here, like Hemingway before him, to remind those "turn of phrase" guys that if you can really write, you don’t need the massive vocabulary or the wit that shines through every sentence. If someone can transmit truth, beauty and emotion with utter clarity in a simple melody, then a symphony suddenly seems unnecessarily complex. If you're wondering about my bloglag, it's cuz I couldn't put down the latest from Bob Sloan. Home Call is a gritty read with loads of local color. Jesse Surrat has a love/hate relationship with his home town in Appalachia and must abandon his reclusive existence when he discovers a young woman being tortured on his land. The escalating stakes force him to deal with the demons from his youth as he battles the evil that has corrupted Midland. Sloan pulls us along relentlessly with crisp, strong prose. His command of dialog rocks, too: you can hear the accents without him spelling them all out (which I hate). Read Chapter 1 here and/or order Home Call from the link on Sloan's site. After a career in the Navy and three failed marriages, Jesse Surratt returns to his native Eastern Kentucky to maintain his family farm and to foster his own loneliness and isolation. Although he feels called to return, he doesn't really know why. He is, after all, returning to a place where at seventeen, he suffered a humiliation so searing that all he wanted to do was run away from Hawkes County and never come back. But come back he does, and soon shapes his life into a "cycle of rising early and working hard enough to sufficiently exhaust himself that sleep came easily." He takes comfort in knowing that everything he can see from his front porch belongs to him and tells himself he is returning to the simple lifestyle of earlier generations. He carves because he grandfather did, and cans vegetables with his mother's recipes. With his 56th birthday approaching, he congratulates himself that farm work has restored him physically. He leaves the farm only when he has to, and he views the residents of nearby Midland as acquaintances rather than friends, always conscious that the community must remember what happened to him when he was seventeen. Jesse has let his third marriage dissolve because he dismissed as "psychobabble" his wife's efforts to bring him to terms with how tragically and unnecessarily he had allowed the early trauma to determine his whole personality. In his heart he realizes she's right but feels powerless to change, knowing he will turn to the bottle of bourbon under the kitchen sink instead: "He'd drink against isolation and conviction his life had been years of waste, capped by the pointless return to the farm." Whether the farm is an Eden or an escape becomes moot, however, because events around him soon shatter Jesse's isolation and force him to deal with darker forces than he has ever known. When he rescues a young African American woman from being burned to death on land adjacent to his farm, Jesse is forced to acknowledge the reality of a community, a whole region, engulfed in the drug trade. The rescued woman, Alma Washington, quickly enlarges Jesse's vision to encompass a world not of quaint moonshiners winked at by local sheriffs, but of an interwoven corruption fueled by sums of money so large that violence is guaranteed and no institution -not even the local university- can be completely trusted. One of the pleasures of reading Home Call is watching Jesse Surratt wake up and become the person he was meant to be. Alma, quoting her grandmother, reminds him that quot;'Hiding ain't healing, mister'," and her own resilience helps to restore his. Another distinct pleasure is experiencing the way Sloan includes elements so familiar in narratives of Appalachia and the South as to be stereotypical - the isolated community, the loner returning to his homeland, the call of the bourbon bottle, racism, and even a stubborn old mule - and weaves them in surprising and meaningful ways. Just as the reader thinks "I see where this is going," it doesn't. Home Call, while suspenseful and troubling, is also darkly humorous. Jesse and Alma, even when death stares them in the face and every second ticks toward doom, cannot be without cigarettes. Also the personalities of Hawkes County residents are sharply drawn, and their quirky ways thus hint at how these people Jesse thinks he knows so well will eventually astonish him. Readers will be haunted by some of what they encounter in Bob Sloan's Hawkes County. They will be heartened also. And most important, they will be deeply entertained.